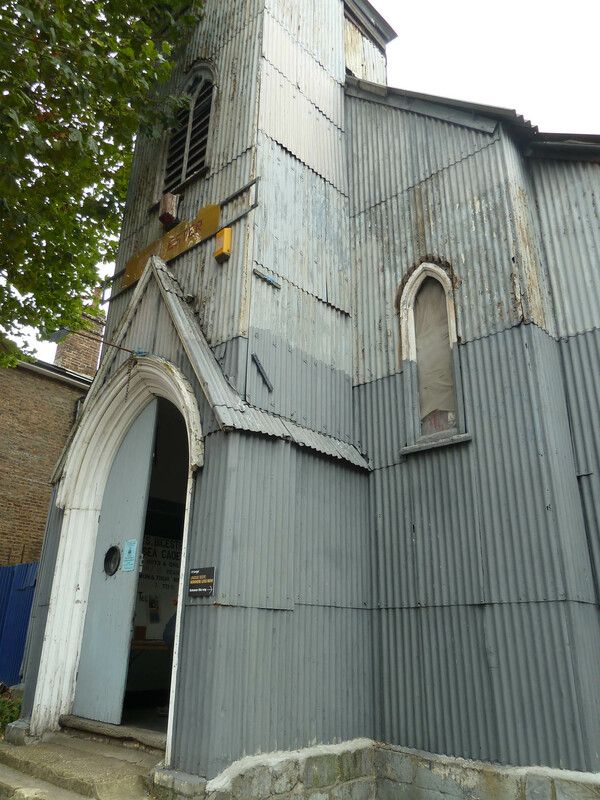 It has been nearly a week since I visited the Tin Tabernacle in Kilburn and I’m digesting what I saw. But, I think that is the point of the work – it is intentionally so complex that we go on pondering its meanings and will never quite fully understand every component. The Tin Taberacle. Own photograph. 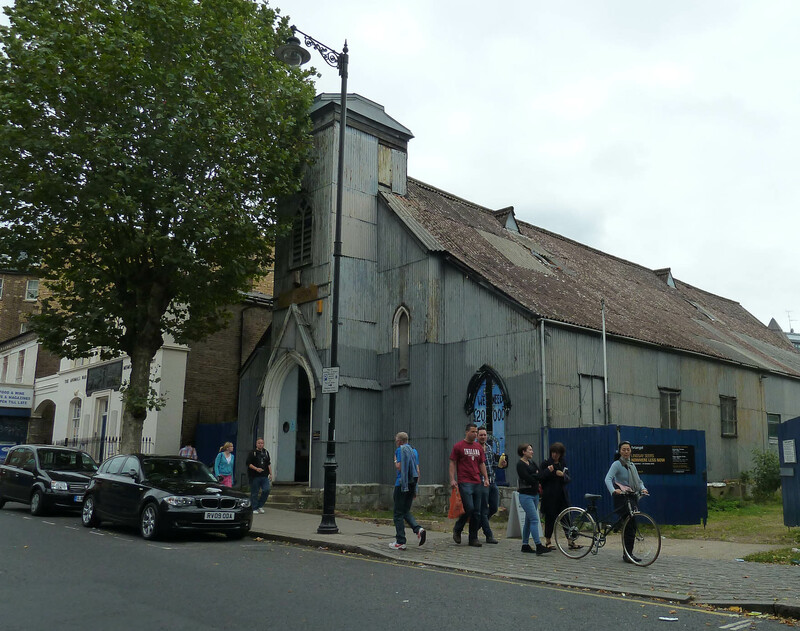 Artangel’s latest project is a commission by artist Lindsay Seers taking place in the Tin Tabernacle in Kilburn, a remarkable corrugated iron chapel that I was quite curious to see. Artangel seek to take art out of traditional gallery settings and open their projects up to new audiences. They are offering free tickets on a Wednesday afternoon to allow those who may not be able to afford to pay an opportunity to experience the work. Not only have they hit the nail on the head with this incredible project but they have made it accessible and, as ever, they must be applauded. Flat-packed corrugated buildings, such as the Tin Tabernacle, were sent by the Victorians to colonies all over the world to act as temporary places of worship. 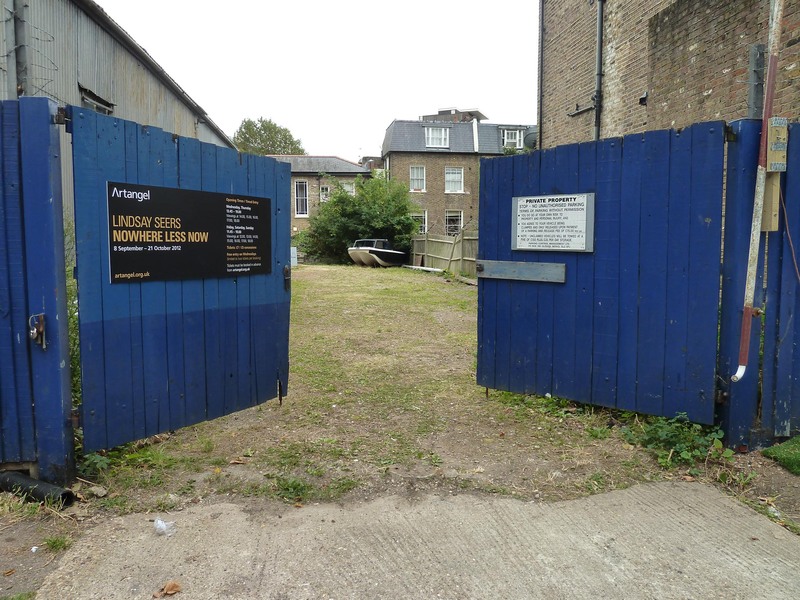 This specific example, constructed in 1863, is now a Grade II listed building that has been home to the Willesden and St Marylebone Sea Cadets since 1949. Shortly after occupying the site, they transformed it into a training ship so the building has portholes, rigging, a 1943 anti-aircraft gun and much more besides. Although the outlines of a ship are normally present, the building is no longer recognisable and a lot more has been added to it in the creation of Seers’ piece. Inside The Tin Tab. Own photograph. Entering the Tin Tabernacle was the start of my adventure. You walk through a grubby yard at the side of the church and are shown into a waiting room – the ship’s wardroom. Music calls softly from everyone’s headphones. When everyone has arrived, you’re shown into Seers’ world where nothing is as it seems. Entering the building. Own photograph. The idea of creating spaces and buildings is not new to Seers. The Tin Tabernacle is a living museum and much of what you see belongs to the Cadets although it’s impossible to tell what was here and what was not. And so starts the endless impossibilities of this piece. Nowhere Less Now is a poignant amalgam of film, photography, sculpture, performance, animation, philosophy and writing that brings together research, history, autobiography and fiction in an exploration of time, place, family, sea-faring, masonry and more besides. The work consists of two films projected simultaneously onto specially designed screens, resembling two eyes – a theme which is omnipresent throughout the work in the discussion of heterochromia, a condition that results in different coloured eyes. The multi-layered soundtrack is played through the headphones creating an intimate and more personal experience. A still from the film piece. Image via www.telegraph.co.uk. Magical realism comes into play with Seer’s multi-media installation, blurring boundaries between truth and fiction; the magic of Seers’ art is that we are unable to distinguish which is which. She establishes extraordinary connections and creates experiences that set off connections within your mind. The story tells us of her great great uncle, George Edwards, a sailor who was born on 27th September 1866, a hundred years to the day before she was born (look carefully and you can find a photograph of George on one of the walls). He sailed to Zanzibar where she had previously discovered another prefabricated church. 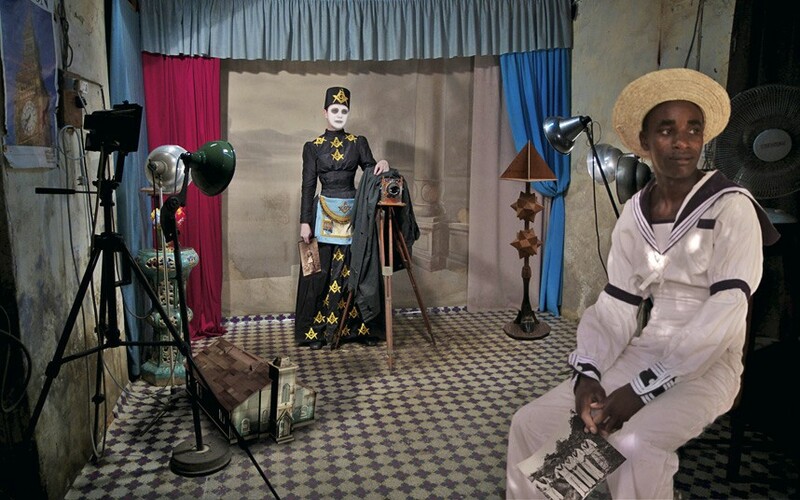 The story also involves a present day African sailor called George and takes us to a George in the future where photographs have ceased to exist. A still from the film piece. Image via www.timeout.com. Seers feels that we experience everything through complicated connections and her work aims to represent the experience of ‘being’, jumping backwards and forwards as these connections progress and develop. When the film ends, we’re left with so many questions. I don’t want to describe the video in any more depth as part of the beauty of the work is the mystery. Before leaving the Tin Tabernacle, you have the opportunity to wander round the dimly lit space for ten minutes not really knowing what to make of the surroundings. The act of experiencing the site is a one-off voyage of discovery. 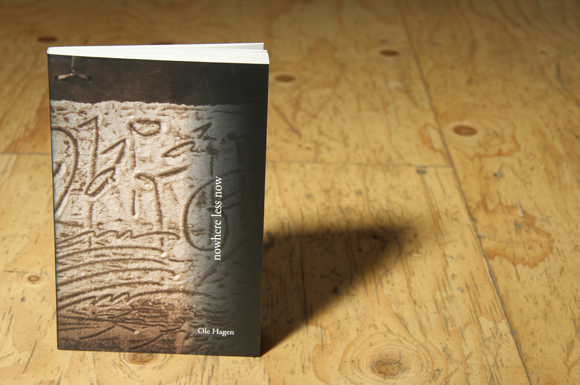 On the way out, visitors are handed a fairly substantial book and this is my one criticism – everything is meant to be unresolved and no-one should have to feel the need to read nearly 200 pages in a bid to help them untangle the webs of Seers’ work. The book that’s handed out on exit. Image via www.immprint.com. It’s easy to forget where you are and walking back onto the street is quite disorientating. Seers has a unique way of seeing things. Is this an autobiographical piece or is this all fiction? We’ll never know. Are the people in the film who we think they are? Again, the implausibility of the story is meant to baffle and move us. Whatever you take from the content of the piece, the method of projection, design and transformation of building and the overall construction are so beautiful and dreamlike and executed to such a high degree of finish that you can’t help but be moved in some way. 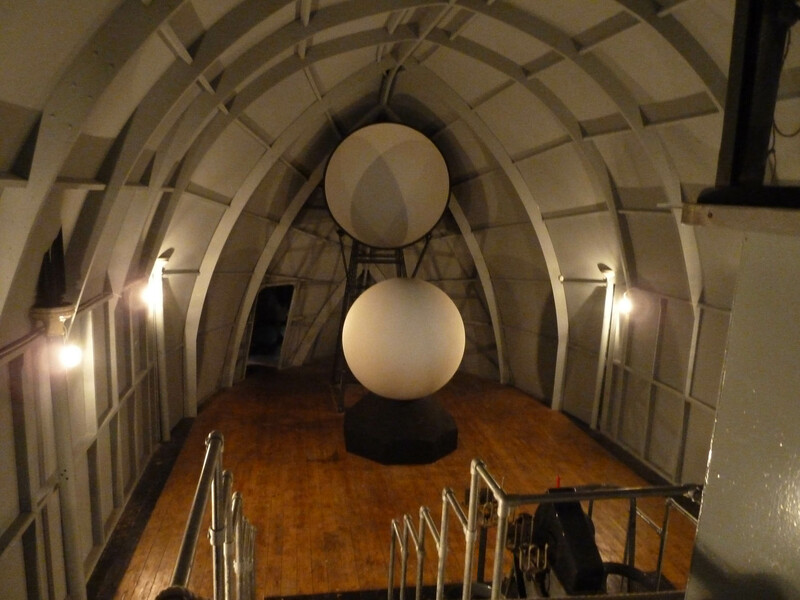 Lindsay Seers: Nowhere Less Now is at The Tin Tabernacle until 21st October 2012, www.artangel.org.uk. After a busy week, I decided to pop to the Hayward Gallery’s late night on Friday to see their new David Shrigley exhibition. 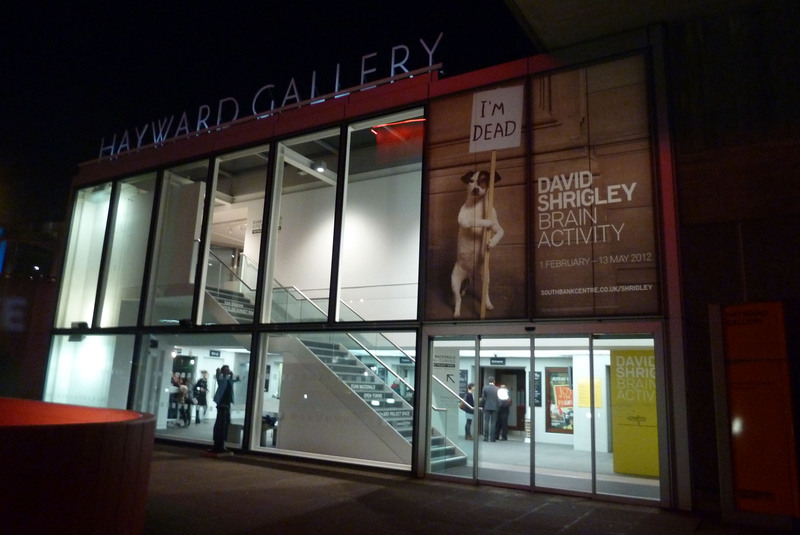 The Hayward Gallery. Own photograph. The Hayward has deviated from their norm for this exhibition. Firstly, after showing your ticket at the main door, you enter via the lift (the attendant and I shared a baffled glance while I waited for it to arrive) which is filled with Monkeys – Shrigley’s spoken word installation. It’s slightly claustrophobic but effective and dramatic. Shrigley is that bit different; people are forced to do as he wishes and he is very much guiding our viewing. And so I arrived at the upper galleries ready to be led wherever the artist wanted to take me. 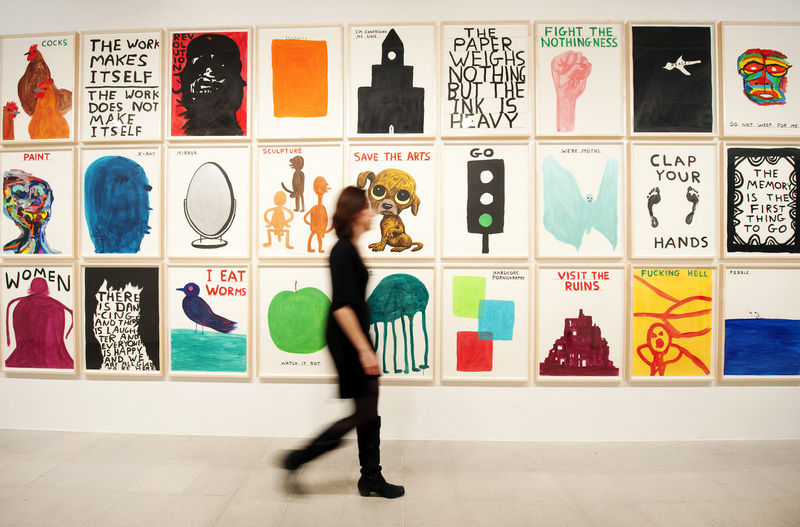 Installation view of David Shrigley: Brain Activity at the Hayward Gallery. Image courtesy of the Hayward Gallery and via www.southbankcentre.co.uk. 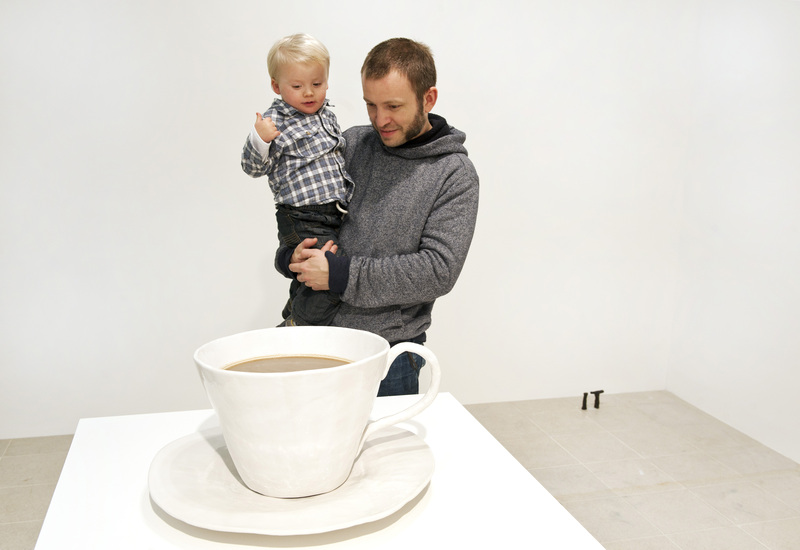 David Shrigley, Very Large Cup of Tea, 2012. Image courtesy of the artist and via www.southbankcentre.co.uk. At the Glasgow School of Art, he wasn’t considered a serious artist and he left with a 2:2. He was already antagonised by the establishment because they felt his artwork was inappropriate and more cartoonish than fine art. So, on leaving the GSA, he became a cartoonist – not to take heed of them but to escape the environment and the people who kept degrading and undermining his work. Eventually, he reconsidered and in 1995 his work was featured on the front cover of Frieze magazine. Shrigley had made it, he was somebody. Given this background, it is natural that Shrigley has little respect for the art world and he has never sought to fit in. A Glaswegian, his sense of humour is often coarse and he has no issue in ‘sticking two fingers up’ at the art institutions that have made him famous. He has a dark humour that comes from a deep sense of frustration and drawing, for him, is a cathartic process. Shrigley isn’t as you’d expect him to be – he’s quiet and polite, clean-shaven and wears socks with his sandals. He works calmly for eight hours a day; he is not the madman that some of his works would suggest. 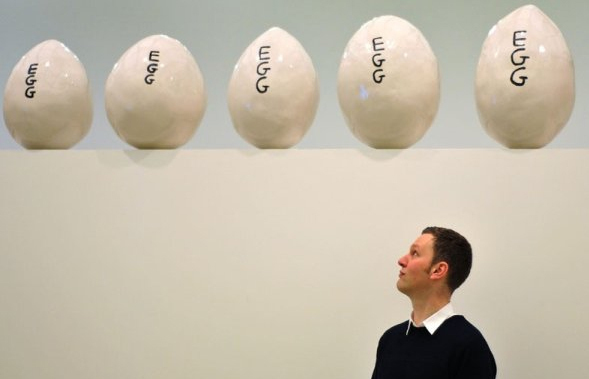 David Shrigley with his work. Image via www.mydaily.co.uk. 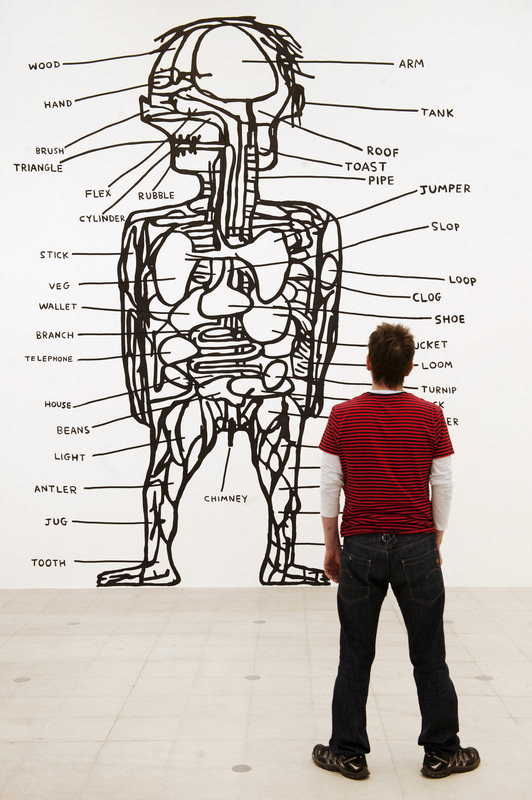 Shrigley appeals to people who aren’t typical art lovers. He produced a weekly cartoon for the Guardian for many years and has also been the political cartoonist for the New Statesman. He doesn’t try to shy away from this and very much has a foot in both camps (cartoon and fine art) – he is overtly commercial and his work is found on t-shirts, badges, cards, duvet covers and tattooed onto the bodies of numerous fans. 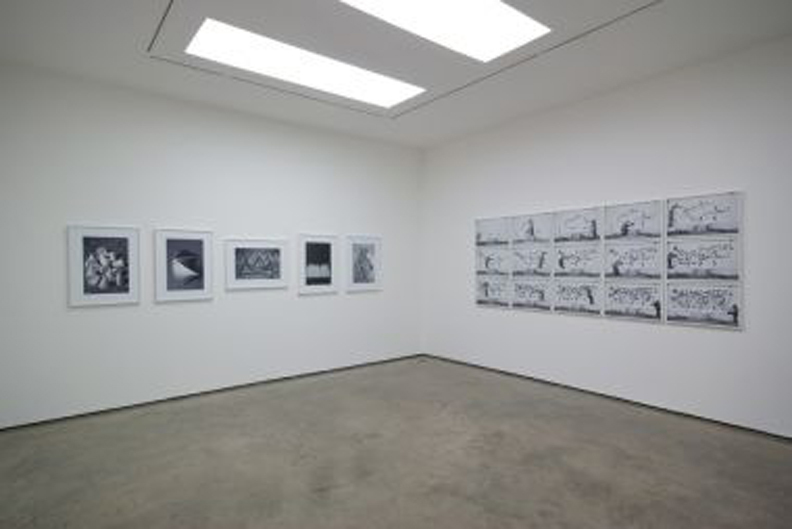 Cartoons, however, are normally tidy and highly finished whereas Shrigley’s works are usually messy with crossed-out sections and scribbles. His drawings and animations, which play on a range of familiar social subjects and everyday situations, are often awkward and crude while remaining immediate and accessible. He is not a skilled draughtsman nor does he aim to be. For him, drawing is just a method of communicating, writing a message to convey his thoughts. David Shrigley, Untitled, 2011. Image courtesy of David Shrigley and Yvon Lambert and via www.southbankcentre.co.uk. Shrigley is known for producing thousands and thousands of drawings, a corpus currently thought to include more than 7,000 works on paper. There were around 25,000 but he discards a lot. We don’t, however, feel the impact of his relentless scribblings here. There’s not enough on show; the exhibition features around 240 works which may seem like a lot but I wanted more. Shrigley is absurd: there’s a bell with a card saying ‘not to be rung again until Jesus returns’, a childish painting of a door marked ‘door’, a sign that says ‘hanging sign’ as he plays on the obvious in a comic way, a taxidermied rat placed under a fake wall and ominously visible as you pass by (ick! 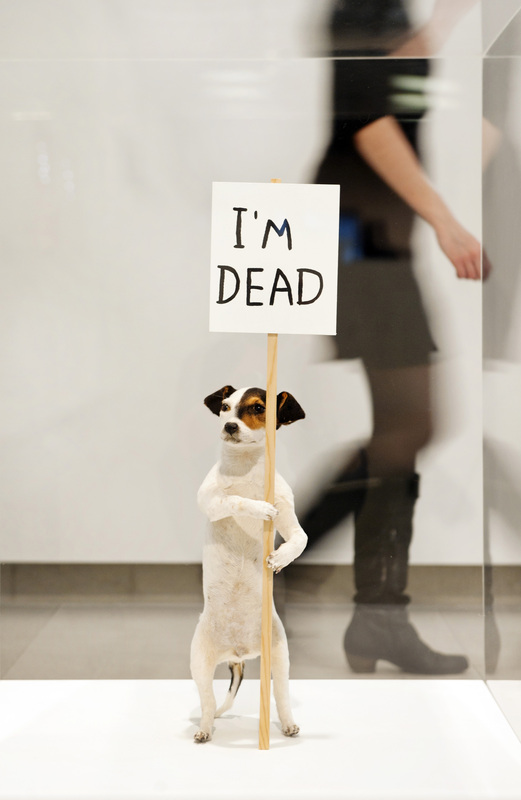 ), and his, now-famous, taxidermied dog holding a placard that says ‘I’m dead’. David Shrigley, I’m Dead, 2010. Image courtesy of the artist and via www.southbankcentre.co.uk. Death and the macabre are frequent themes in Shrigley’s work. 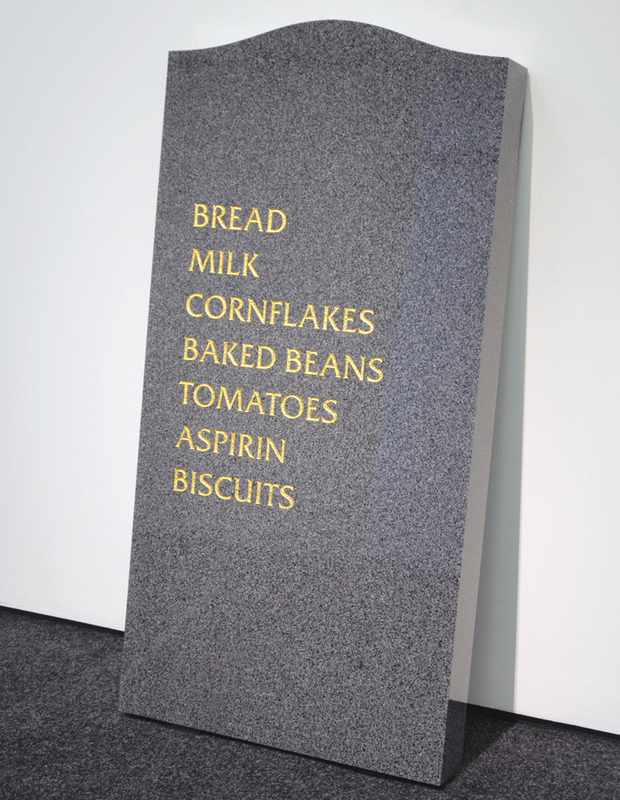 A gravestone with the words ‘Bread, Milk, Cornflakes, Baked beans, Tomatoes, Aspirin, Biscuits’ is an ironic take on our day-to-day consumption. 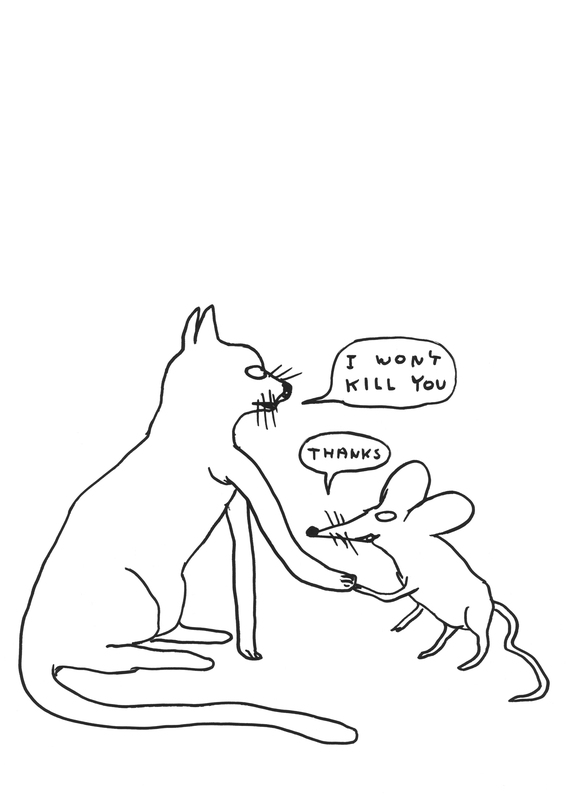 Shrigley commented that he prefers to see the humorous side of death as it isn’t something we can avoid. Like me, he’s always been interested in lists and enjoys placing seemingly random information together in a way that forces it to become coherent. His message may often be pessimistic but, notwithstanding this, he’s often able to induce a smile. In the darkest of subjects, there is always some light to be found. David Shrigley, Gravestone, 2008. Image courtesy of the artist and Stephen Friedman Gallery and via www.southbankcentre.co.uk. In one of the outside courtyards stands a stick figure. Try to get closer though and you can’t. Shrigley has stuck the door, teasing us. Again, we go where Shrigley tells us to. One room has a fake wall with 12 eggs on top – suggestive of Humpty Dumpty as a small Alice in Wonderland-styled doorway in the wall allows you to see the feet of those passing by (the perfect place to check out the footwear). Again, we want to go there but it’s not that easy. The other courtyard is exhibiting Look at This but we can’t get out there either. Visitors were smearing away condensation from the windows to try to look. The joke is on us. Some of the works are a bit bland but I think, like a comedy act, this level of humour is impossible to maintain all the time. Brain Activity is actually the best-curated exhibition I’ve seen here in a long while. It has been skilfully planned and lit and really transformed the gallery space. Shrigley has made the Hayward his own. 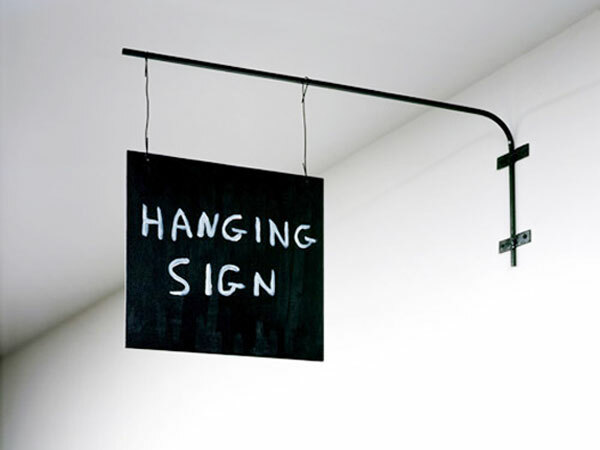 David Shrigley, Hanging Sign. Image via www.whosjack.org. While walking round I overheard someone uttering the predictable ‘is it art?’. Although this is something that people often ask of Shrigley, this is now an old and boring question. He thought to do it. They didn’t! I don’t think Shrigley’s art is funny all the time but I caught myself smiling when I least expected to and, it was nice to see that the exhibition was having the same effect on other people. Like a Mexican wave, a shared joke was moving across the galleries. Shrigley’s aim is not to make people actually laugh – this is just a by-product of his art; using simple mechanisms and objects he seeks to engage people through humour. 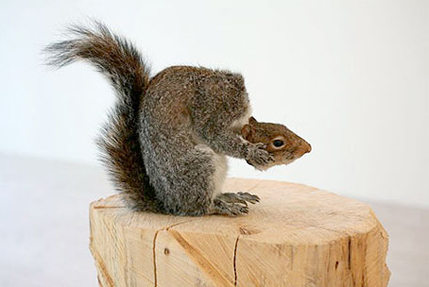 David Shrigley, Nutless, 2002. Image via www.thedrawbridge.org.uk. But (and it’s a big but), the exhibition only takes place upstairs. The ground floors will be given over to the Jeremy Deller exhibition which opens on 22nd February. Fortunately, there’ll be a £10 joint ticket so visitors aren’t expected to pay twice for what is normally one exhibition space but I still felt let down. I was enjoying the exhibition and it finished far too soon. David Shrigley, Untitled, 2012. Image courtesy of the artist and via www.southbankcentre.co.uk. You don’t need to know anything about Shrigley or his practice to enjoy these works. There will be no added pleasure from doing your homework before going to this exhibition. Shrigley’s ‘stuff’ is eclectic to say the least. It shouldn’t be funny but it is. I just wish I’d been given the opportunity to laugh at more. It was good but it wasn’t great as I know that Shrigley could have filled the whole of the Hayward and I’d have come away more satisfied. David Shrigley: Brain Activity is at the Hayward Gallery until 13th May 2012, www.southbankcentre.co.uk/shrigley. With a bar set up on the pavement in Hoxton Square, White Cube certainly know how to make the most of the sunshine. But, as is often the way with White Cube PVs, lots of the drinkers seemed to have migrated from nearby offices and bars rather than having come to see the exhibition. Well, I wasn’t only there for the beer! I had tripped specially over the East End’s cobbles to have a look at Robin Rhode’s new work – his second White Cube exhibition. 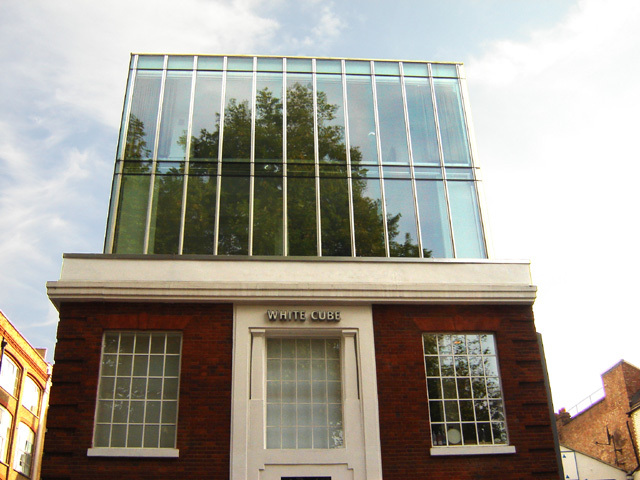 White Cube Hoxton Square. Image via http://en.wikipedia.org. Initially, making performances based on his drawings of objects with which he interacts, Rhode frequently works with everyday materials – the focus of this exhibition is a chair. His now highly sophisticated digital animations use sequences of photography combined with drawn imagery, uniting various media. Rhode often returns to his native South Africa re-creating the scrappy energy from his local street culture and combining it with every-day materials which he then transforms using high-tech animations. Treating the drawing as a three-dimensional object, Rhode’s work is often contradictory in concept. Downstairs at White Cube has become a blackened cinema which presents five animations, taking the chair designs of Gerrit Rietveld as their starting point. Rhode’s uses his own electronic soundtracks to accompany the installations with music ranging from therapeutic to unsettling. Military Chair, 2011. Image via www.whitecube.com. 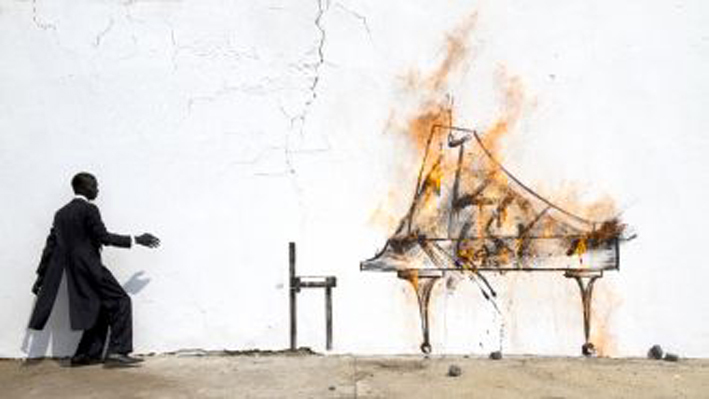 Piano Chair shows the annihilation of a piano where the chair, normally the aid for playing, is used as an object of destruction. 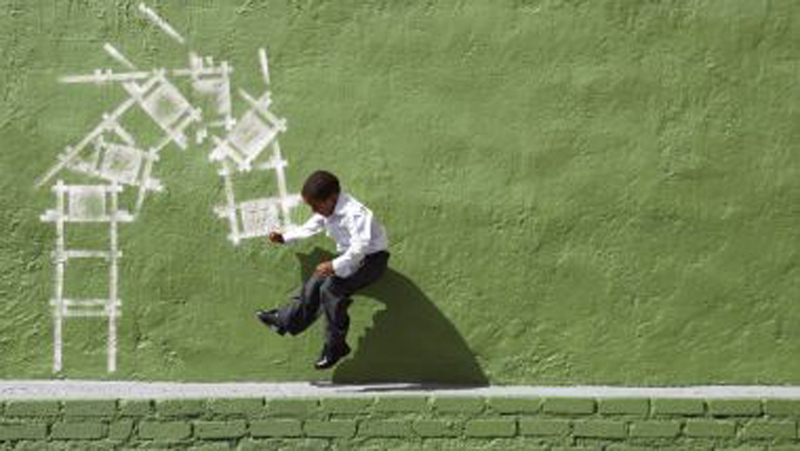 Often drawn on walls, reminiscent of street graffiti, as seen here, the charcoal line drawings are child-like in their execution, moving around the walls on their animated journeys. The composer is trying to kill his piano – not something we normally witness but an act that is absurd, sad, debilitating. Piano Chair, 2011. Image via www.whitecube.com. Some of the works successfully make use of a two-screen projection. Kinderstoel , for me, the most resonant of them, is one such piece that changes screens midway through the animation. Kinderstoel, 2011. Image via www.whitecube.com. The animations are played in sequence so that we move around the room as they do – another piece that implicates and involves the spectator. Upstairs at White Cube. Image via www.whitecube.com. 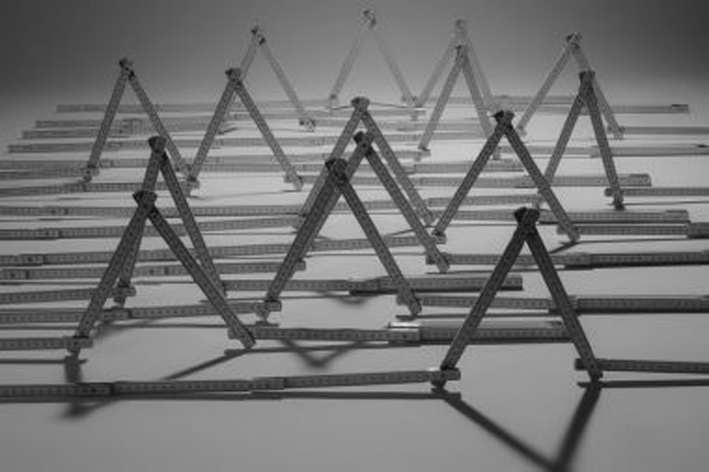 Upstairs shows two new series of black and white photographs inspired by Blaise Pascal and his 1653 treatise on the arithmetical triangle. Pascal’s Plates, 2011. Image via www.whitecube.com. There is no doubt that this is good work but I didn’t feel it was great. Compositionally, all the works are strong but nothing excites me in the way Rhode’s work has in the past. Robin Rhode is at White Cube Hoxton Square until 9th July 2011, www.whitecube.com.